There’s no way around it. If you wouldn’t recognise Queens of the Stone Age, and don’t know Q-Tip, then Q is for Queen. I think my main problem with Queen’s music is overfamiliarity. If I’d have found Killer Queen myself instead of having it forced upon me, I’m sure I’d appreciate it a lot more. There’s only so much enjoyment you can get out of a song when you know every note. I’d never heard this song on the radio or TV, and had no idea how popular it is. This is a beautiful song and is about as stripped back as Queen gets. “When lonesome goes up as down goes the day” (Bob Dylan’s words, not mine), this song can really help. The louder the better. It doesn’t fix things, but it’s a start. Of course that was back then, life is sweet now. This collaboration between Queen and David Bowie was far from an effortless creation. Starting life as a song written by Queen drummer Roger Taylor, Bowie took over the lyrics and Freddie Mercury the musical arrangement. Bowie and Mercury had a falling out over the mixing of the song, and the band had misgivings about releasing it as a single. They may have changed their minds, playing the song at every Queen concert from its release to the end of their touring history with Mercury in 1986. It became Queen’s second UK number 1, and with its instantly recognizable baseline, it is regarded as one of the classic songs of the eighties. The final track from Queen’s second to last studio album, Brian May’s tribute to his ailing mate was released before Mercury’s failing health was public knowledge. His deterioration meant that the accompanying video was a montage of earlier clips. Issued initially as a single six weeks before Mercury’s died in November 1991, it re-entered the UK charts in early 1992. 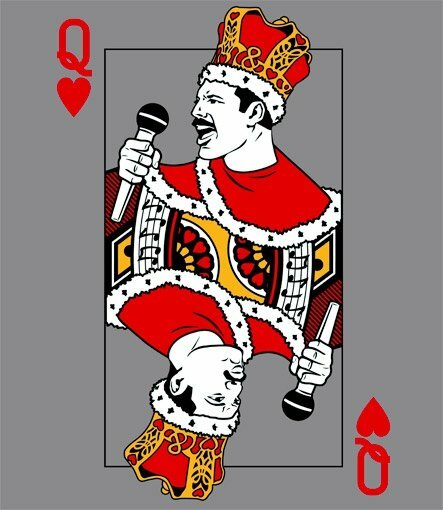 These videos have reminded me what an amazing singer and front man Freddie Mercury was – I may have to expand my Q section. This entry was posted in Music and tagged Brian May, david bowie, Freddie Mercury, John Deacon, Love of my life, music, Queen, Roger Taylor, Somebody to Love, The Show Must Go On, Under Pressure. Bookmark the permalink. I enjoyed putting it together too 🙂 Trust you’re recovering after the Melbourne Cup-induced tumble.